We offer a wide range of natural ingredients that can be incoporated in every type of treatment. Seaweeds are mainly hand-collected by our "Goémoniers" (local seaweed harvesters) on the foreshore at low tide. They are then brought to the premises, washed, dried and sieved within 24 hours. Seaweeds can then be micronized to increase their efficiency by releasing their minerals and other actives. Lithothamnium Calcareum is a red seaweed belonging to the family Corallinaceae. Its thallus is shaped like a miniature tree several centimetres long with branches of a few millimetres, so that it resembles a coral. In Brittany it grows on sandy seabeds at a depth of about thirty metres. It grows extremely slowly, giving it time to filter and absorb large quantities of nutrients from the sea, especially calcium and magnesium, which it is able to retain because of its great porousness. It can form reefs several centuries old. Laminaria digitata (kelp) is a brown seaweed belonging to the order Laminariales. It is one of the largest seaweeds occurring on Brittany coasts. Its glossy brown thallus can reach 3 to 4 m in length. It has a cylindrical, smooth, flexible stem called a stipe and a thallus divided into laminae. This thallus is fixed by a holdfast to the rocks near or below the low tide level down to a depth of 10 m.. This type of seaweed is considered to be the anatomically most advanced. One of the specialities of the kelps is their high concentration of extractable alginates, which give them their flexibility allowing them to withstand the pounding of the waves. Ao Nori is green seaweeds belonging to the order Ulvales. This seaweed, that is sometimes called Hollow Green Weed in English, includes several commercially exploited similar-looking species. The thallus is tubular and flattened in shape and more or less branched, or sometimes in the form of a simple ribbon of variable width but usually rather constant for a given individual. These are short-lived seaweeds that appear especially in spring. They occur in all types of habitats, in exposed or sheltered conditions and on rocks or on gravel. Ascophyllum nodosum is a brown seaweed belonging to the order Fucales. It grows on rocks at about the mid intertidal level in exposed areas, where it replaces Fucus that prefers calmer waters. The brownish-green thalli grow in tufts, each of them composed of strapshaped fronds of different ages all growing from a common holdfast base. These thick flattened straps can reach a length of 1 to 1.5 m and have nodes at intervals along their length with air bladders that serve as floats so that the plant can stand upright in the water. They are irregularly branched with short lateral branches. The age of the seaweed can be deduced from the number of nodes - they can often live for more than fifteen years. Chlorella is a microscopic unicellular alga measuring about 5 Î¼m across. It occurs in warm freshwaters throughout the world. The alga contains an exceptional growth factor that enables it to divide and reproduce very quickly. It forms part of the phytoplankton - the very basis of the aquatic food chain that is the basis for life on Earth. 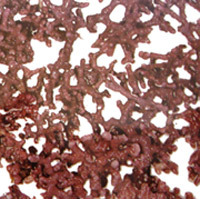 Dulse, Palmaria palmata, is a red seaweed belonging to the order Palmariales. It has a more or less palmate frond shape, from which it derives its name. The reddishbrown blade has a thallus that is dichotomously divided into strips 2 to 3 cm wide and up to 50 cm long. It is attached by a basal disc-shaped holdfast and grows in the intertidal zone on rocky substrates, up to the high water mark where it occurs as an epiphyte growing especially on Laminaria hyperborea. Fucus vesiculosus is a brown alga belonging to the order Fucales. It grows on rocky shores where it is exposed at low tide. Its flattened thallus, a few tens of centimetres long, is dichotomously branched. Either side of the midrib it bears bladders filled with air - hence its name - that serve as floats so that that it stands vertically in the water. During the reproductive season, the thallus stops growing and conceptacles form at the tips, which then release the gametes. Himanthalia elongata is a brown seaweed of the order Fucales. It is solidly fastened to its substrate by a disc-shaped holdfast with a stalk and grows in the form of two thick ribbons that can reach a length of 2 to 3 metres. It is an annual species that disappears at the end of summer after the two ribbons have completed their reproduction. Growth then starts again in early winter with the formation of new shoots. Flourishing at the low tide limit, Himanthalia elongata is said to be infralittoral. Ulva lactuca, called Aosa in Japan, is a green seaweed belonging to the order Ulvales. It occurs in the form of thin crinkled leaves sometimes rolled into a spiral, with a maximum length of 30 cm. The very thin blade, consisting of a double layer of cells, is fixed to the substrate by a disc to which it is connected by a very short stipe. Despite its thinness it is surprisingly resistant to tearing because of its high content of elastic fibres. Ulva lactuca occurs in a wide range of habitats, both sheltered and exposed, from the shore to far out at sea. The frond shrinks in winter, then grows again in spring. The green colour also changes with the seasons, changing from very light to dark green. Chondrus cripus, Irish Moss or Chondrus crispus is a red seaweed. Irish moss owes its cosmetic qualities to its carrageenan content. Its moisturising properties make it very pleasant to apply. Irish moss is therefore in the formulation of creams, masks and wrappings. Irish moss's gelling and texturing properties are made use of in the manufacture of cosmetic products such as shampoos and emulsions. Finally when ground to the T10 size, Chondrus cripus is valuable for exfoliating purposes in products such as exfoliating and moisturising massage soaps. Porphyra is a red alga belonging to the order Bangiales. Its scientific name simply comes from the word for the colour purple. In terms of structure it has an extremely thin frond, thinner even than sea lettuce since it consists of a single layer of cells. This frond can reach a length of 60 cm. It grows on rocks in exposed wave-beaten coastal areas in the mid intertidal zone. It has a short lifespan, but because is reproduces quickly it can be found almost throughout the year. The queen of the Algues Gastronomes®, Salade de la Mer® is an unique product. This recipe is a balanced blend of Dulse, Sea lettuce and Nori. The design of this concentrated blend on these three seaweeds, each in precise proportions, thereby letting each of them express their flavours and bring out their own respective colours (red, green and black). Spirulina is a blue-green alga now classified in the Cyanobacteria. It is a microscopic unicellular alga with a spiral shape 250 Î¼m long and an intense blue-green colour. It grows wild in tropical and subtropical inland water bodies. Micro-algae such as Spirulina constitute the phytoplankton, which is the basis of the aquatic food chain. They are therefore essential for all life on earth. Undaria pinnatifida is a large brown seaweed belonging to the order Laminariales. This seaweed attaches to rocks by a hapteron (holdfast). The stipe is flattened with dentate margins that turn into lobe-like projections. The blade is a translucent green colour, triangular and lobed, with a pronounced midrib. It grows in shallow water but can grow to a length of 2 to 3 m. It originated from Japan, and then arrived in the Mediterranean from where it has now spread to Brittany. We also offer seaweed extracts which can concentrate specific elements and facilitate their use. The main species are already available according to generic specifications in dry or liquid forms. The Ascophyllum Nodosum Dry Extract is a 100% natural product, used for different types of applications. Its main interest is its high solubility in water which allows its incorporation in different liquid formulation. Fucus vesiculosus is a brown algae from the Fucales family. It grows on rocks which are uncovered at low tide. Its flattened thallus, which measures a few dozen centimetres, branches out at random. It has air bladders around its central nervous system, full of air - giving it its name - which enable it to float and maintain a hold in the water. During its reproduction period the thallus stops growing to conceptacles at its end which will release gametes. The Lamivert® (Laminaria digitata) Aqueous Extract is a 100% natural product, used for different types of applications. Halophytes are marine plants that naturally grows in saline environment such as seashores, coastal dunes, rock crevices, salty marshes... They are covered at high tide or showered by spindrift. One of their qualities resides in the fact that they have a natural ability to resist harsh conditions such as being exposed to seawater spray, wind and salty soils. We offer you Halophytes collected from its 20 ha cultivated field located in the west part to Brittany. The cultivation of marine plants helps preserve the environment’s biodiversity and control the genetics in order to constantly supply optimum quality products. Growth techniques conform with the Ministry for Organic Agriculture's guidelines. These marine vegetables are processed in order to concentrate their specific properties. A perennial plant from the Plumbaginaceae family, Armeria maritima grows in compact, round clusters resembling small cushions. It is also known by the names “Grass of Olympus” or “Spanish Grass”. Its pink flowers appear between June and August. Typical of sea cliffs and grass that has been exposed to sea spray, this plant also grows in salt marshes and grassy dunes. This plant from the Asteraceous family (sunflower family) grows in salt marshes and their surroundings. Their long, oval leaves can become quite thick. They have yellow and mauve, or simply yellow leaves which appear between July till and August. The Sea Beet, from the Chenopodiaceous family, is the wild ancestor of the regular beetroot and also the Swiss chard (another type of beet). This perennial plant, common in coastal areas, can be identified among the shingles by its glistening green leaves. Although rare, this perennial, northern Brassicaceae can be found growing in Brittany and on the Northern Channel coastline. It is characteristic of rugged surroundings of coastal shingle strips. Also known as Sea Cabbage, it has green leaves with blue tinges and clusters of white flowers. The Silver Ragwort is a perennial plant from the Asteraceous family. It thrives in dry, sandy soil. Its silvery-white and velvety leaves form clumps between 40 and 60 cm tall. It has vibrant yellow flowers that blossom during the summer. Sea Fennel is a coastal plant belonging to the family Umbelliferae (now Apiaceae). Its English name is a corruption of the French Herbe Saint Pierre. The yellow flowers are grouped into umbels with oval down-curved bracts. The thick fleshy leaves are alternate and trifoliate with linear leaflets. It grows to a height of 30 cm above the high water mark, firmly anchored among rocks, pebbles and sand, and especially on cliff ledges where it is exposed to the wind and the salt spray that supply it with minerals. The fleshy leaves are a beautiful shiny bluish-green colour. It is both a medicinal and an aromatic plant that has been known since Antiquity. Harvesting takes place from June to August at which time it is richest in essential oils. This is a biennial or perennial plant, from the Asteraceous family. It grows on cliffs and rocks close to the sea. It can be identified by its small umbrella-shaped, yellow flowers (blossoms from June to September) and very long leaves. For the ancient Anglo-Saxons it was one of the 9 sacred herbs used to fight the 9 possible causes of illness. The Golden Samphire is a perennial plant with long stems, from the Asteraceous family. At first glance, its leaves can be confused with those of Samphire. From July to September, the plant forms clumps of bright yellow flowers. It releases off a scent reminiscent of "underwood". The Sea Lavender belongs to the Plumbaginaceae family. It blossoms from July to September with magnificent blue-coated flowers similar to those of regular lavender. Mostly found in salt marshes, its yellow leaves known as “Pig Ears” were actually eaten in the past. Sea Chamomile is a herb from the Composite family. It is often found on beach tops and sand dunes. It can be spotted from a distance by its daisy-like flowers, blossoming from reddish, sloping branches. Sea chamomile looks like chamomile. It grows in tufts low, with small greyish leaves. From June to September flowers appear that release a pleasant fragrance. Petal color varies from pale pink to bright pink and have a notched end. The evening primrose is a biennial plant from the Oenothera family and is also known as “Beauty of the Night”. Its dazzling yellow flowers appear between June and September. After flowering, the plant produces fruits in the form of pods containing small, brown seeds. This plant is widespread throughout temperate regions where it grows on sloping, sandy and uncultivated land. The Oyat is a perennial herb 0.5 to 1 meter with a strong root system. Belonging to the family Poaceae, its scientific name literally means "friend of the sand." It is located on top of the dune, where it thrives in large inputs of sand. Highly resistant to drought, extracts of rhizome showing moisturizing very interesting. Also called “Glasswort” or “Marsh samphire”, Salicornia is a fleshy annual or perennial plant forming a strongly rooted dwarf shrub a few tens of centimetres high. The jointed stems end in a succulent spear which forms the part harvested. It grows on mud flats and in salt marshes that are successively flooded and uncovered by the tides, giving it its salty taste. If conditions are right it can form dense uniform lawns, which form spectacular landscapes. This perennial plant, from the Caryophyllaceous family (carnation family), can be easily recognised by its white flowers with stems of deep purplish-red. Its flowers form white expanses across cliff tops and produce a subtle scent similar to jasmine, as it is a honey-yielding plant. We offer you qualitative essential oils and floral waters. These products, from marine plants, are obtained by water distillation. Fresh plants are soaked in a water-filled still. Steam goes through the plants, releasing the aromatic molecules which condensate. Through a difference in density, essential oil separates from floral water. Essential oil and floral water are mainly used in cosmetic formulations. Golden samphire is a perrennial plant with long sterns, from the Asteraceous family. At first glance, it leaves can be confused with those of Samphire. From July to September, the plant forms clumps of bright yellow flowers. It releases off a scent reminiscent of "underwood". Essential oil is a concentrated hydrophobic liquid from the plant's volatile aromatic substances. Golden samphire essential oil is obtained by water distillation. Fresh Golden samphire is soaked in a water-filled still. Steam goes through tha plants releasing the aromatic molecules which condensate. Through a difference in density, essential oil separates from floral water. Sea fennel (Apiaceous family) is a perennial, marine plant found on the French coast. Usually found on cliff tops, this species releases a pleasant lemony, carroty smell. Its curled, yellow leaves grow in umbrella-like shapes. Sea fennel floral water is obtained through water distillation. Steam goes through the fresh plants before condensation. The water collected is called “floral water” or “hydrolate”, it contains elements more or less equivalent to those from essential oil as well as soluble elements. Lightly scented, floral water is very soft for the skin. Essential oil is a concentrated hydrophobic liquid from the plant’s volatile aromatic substances. Sea fennel essential oil is obtained by water distillation. Fresh Sea fennel is soaked in a water-filled still. Steam goes through the plants releasing the aromatic molecules which condensate. Through a difference in density, essential oil separates from floral water. Nature offers lots of other beneficial elements that is concentrated in a wide innovative range. The mud that we harvest comes from Marine Parks or Natura 2000 sites on the Brittany coasts that are protected for the diversity of species they contain or for the quality of their waters. It is composed of extremely fine, naturally micronised, particles, which have been deposited on the seabed over the centuries. The interstitial seawater also contains a quantity of marine minerals, making the sediments even richer and giving them much greater therapeutic properties than simple clays. The Brittany oyster is undoubtedly one of the noblest shellfish in the world. Bathed by the invigorating waters of the Atlantic Ocean, with its rich mineral and plankton resources, it is of the highest possible quality. This quality is found in the oyster's shell. By finely and continuously filtering the seawater that is constantly being replaced in its habitat, the oyster shell can absorb great quantities of minerals. We keep intact all these minerals stored in the oyster shell by an appropriate treatment. The sea is a very rich environment, both in terms of quality and diversity, especially when its minerals and trace elements are considered. The proportions of its elements are extremely close to our body's natural requirements and are almost identical to those of blood plasma. Origin: The seawater is pumped off the coast of Brittany, in the Atlantic ocean. It is pumped from a depth of five meters below the surface on rocky bottoms in calm seas. The seawater is first pumped into a decanter at the end of flood tide (rising tide) on an open site in deep water. It is prefiltered to five microns then filtered to 0,2 microns by a sterilizing filter, after which it goes through a UV sterilizer. Marine Magnesium Oxide is extracted from sea water after desalination and language This aqueous extract is purified and then dried by vacuum evaporation. The product obtained perfectly purified. Magnesium is an essential element for all living organisms and can be supplied by using this product in its very many applications. The sea is a very rich environment, both in terms of quality and diversity, especially when its minerals and trace elements are considered. The proportions of its elements are extremely close to our body's natural requirements and are almost identical to those of blood plasma. This is why we offer you this Seawater obtained by evaporation, which keeps it intact and preserves its richness, in readiness to give you back all its benefits. Origin: Seawater comes from protected sites guaranteeing the very highest purity. It is rich in minerals supplied from the Atlantic Ocean by the mixing of currents and waves, which oxygenate it and make it fresh and full of vitality. Evaporation is a simple process that transforms seawater into a state of fine solid particles, with no heat treatment, so that it conserves all its elements. Our Atlantic Salt, derived from the Atlantic Ocean, oxygenated by the action of currents and waves, is incredibly rich in trace elements that provide the human body with all their benefits. Atlantic Salt is harvested from protected sites guaranteeing the greatest purity. Composed of white crystals, it is obtained by the natural action of the sun, wind and marine currents. We can provide Atlantic Salt of various degrees of fineness (fine or coarse) for practicality in use in all applications. There is implemented a strict selection on several natural ingredients (seaweeds, plants, salts, ...) for their exfoliating properties and processed to be used as they are or in formulated products. These ingredients have an efficient exfoliating action on the face or on the body depending on the wide range of textures and mesh sizes available. Their natural high content in vitamins, minerals and trace element allow simultaneous nourishing and repairing actions for a smooth exfoliation. Some ingredients also give a nice visual effect that reinforce the interest of the product. In the shape of small beads with a high mineral and trace element content, Algalithe® is appreciated for its smooth exfoliating action. Oyster shell powder has a high natural mineral content and is particularly appreciated in body scrubs. For a smooth and natural scrub, Fucopharm® respects and nourrishes the skin. Haricot de Mer®, with a high vitamin C content, has a soft and efficient exfoliation action. Lichen carragheen (Chondrus crispus) is widely used in exfoliating soaps. Its shimmering colours enlighten the products in which it is used. This Atlantic Fine Salt has been selected among local producers for its purity and high quality. It has a very smooth peeling action for face applications. This Atlantic Coarse Salt has been selected among local producers for its purity and high quality. It has an efficient peeling action for body applications. As a ready to use concept, this Microwavable Mask is 100% natural and used for its heating properties without requiring any addition of water. Easy to use, this unique formulation brings a real added value to professional treatments thanks to its extremely light weight and boosting effect. This concept is for professional use to improve cream face mask treatments by making them more active and attractive, for better customer satisfaction. The skin is regenerated and looks fresh and bright again. Inspire: It's the right to be inspired! - A spectacular gel texture: Only 10g of powder will recreate a delicate gel treatment. - An innovative cream texture: A powder that turns into a sensual cream as smooth as silk. - A mouth-watering exfoliating jelly texture: Indulge your skin with our Strawberry, Kiwi and Vanilla gourmet treats. The gel mask is a pure velvet treatment with a sensual touch which brings softness and comfort to the skin. Its rheologic properties turn it into a modelling mask treatment with nice wellbeing and relaxing sensations. Actives and other ingredients may be added. Their penetration will be increased tenfold thanks to this innovative gel texture. If exfoliating elements are incorporated, this treatment will renew the skin. It can also become 2-in-1 concept: a mask (1st phase) and an exfoliating treatment (2nd phase). The skin looks fresh and bright again. This cream mask is 100% of natural origin and has been specifically formulated to be used in the development of spa face treatments with innovative textures. Diatomaceous earth contains natural silica which remineralises and firms the skin. Alginate, extracted from brown seaweeds, is a phyco-colloid with refreshing and hydrating properties. White clay (Kaolin), fortifies. It is recommended for fragile and dry skin thanks to its high content of silica. It remineralises and facilitates the elimination of toxins. Actives and other ingredients may be added. Their penetration will be increased tenfold thanks to this innovative cream texture. If exfoliating elements are incorporated, this treatment will renew the skin. It can also become 2-in-1 concept: a mask (1st phase) and an exfoliating treatment (2nd phase). This jelly texture is the perfect versatile base to formulate all kinds of different spa treatments which is suitable for every skin type. Alginate, extracted from brown seaweeds, is a phyco-colloid with refreshing and hydrating properties. Its rheologic properties turn it into a playful and original treatment. Dextrose has antioxidant properties and improves the softness of the skin. Actives and other ingredients may be added. Their penetration will be increased tenfold thanks to this innovative jelly texture. Its easy and pleasant application provides a real sensation of wellbeing. If exfoliating elements are incorporated, this treatment will renew the skin! Thalasso originated back in the Ancient Egypt, developed in the Antiquity during the times of Hippocrates and Ancient Rome, then knew a new expansion in the XIXth century with a modernized concept. The properties of Thalasso originate from water and seaweeds, containing more than 80 elements beneficial the body: minerals (iodine, calcium, magnesium, iron, ...), trace elements, proteins and vitamins (A, B, C, E, F, K, ...). These marine substances have anti-oxydant, slimming, remineralizing, toning ... properties. Let's work together for the health and the beauty of the body ... naturally! Laminaria are rich in iodine, an element that facilitates the lipolysis of adipocytes. The richness of Laminaria helps nourish the skin and restore its force and vitality. This process is amplified thanks to the heat produced by the wrap. Heat promotes the dilation of pores, enabling a more significant vectorization of active ingredients through the skin. The mineral wealth of Lithothamnium confers remineralizing and stimulating properties. Its absorbent action encourages the elimination of toxins. When applied locally, the wrap's warming effect is also appreciated for its relaxing action. The antioxidants, minerals, vitamins and pigments in this complex (combining Lithothamnium calcareum, Chondrus crispus and Palmaria palmata seaweeds), help stimulate microcirculation. It fights against problems linked to venous insufficiency: painfully tired and heavy legs and "orange peel" skin. The added cryogenic agent soothes immediately the unpleasant sensation of heaviness. Our Thalaceane® Regenerating Bodywrap is a special combination of red and brown seaweeds that concentrate all the ocean's benefits. The cleansing action of Lithothamnium calcareum helps the skin to breathe, to restore its clarity and freshness. The strong hydrating action of Fucus and Laminaria make the skin glow again. Thalaceane® is suitable for face and body treatment. Our Odycéane® Purifying Bodywrap is an effective combination of red and brown seaweeds: Lithothamnium calcareum, Fucus and Laminaria. Lithothamnium calcareum drains the active ingredients from the seaweeds onto the skin and lets the slimming properties of the Fucus and the softening properties of the Laminaria act on the epidermis. Odycéane® is suitable for face and body treatment. 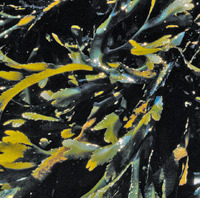 Our Toning Bodywrap selectively combines Laminaria digitata and Lithothamnium calcareum seaweeds. Laminaria digitata is the most widely used seaweed in thalasso for its high marine active ingredients' contents and the smooth creaminess of the paste it forms. Lithothamnium calcareum is well known for its very high mineral content. Fucus vesiculosus and Ascophyllum nodosum supply iodine which plays an important part in terms of slimming and purifying properties. Lithothamnium calcareum has a remineralizing and absorbent action that promotes the elimination of toxins during the treatment. The Slimming wrap is suitable for face and body treatment. Since the Antiquity, marine and terrestrial mud treatments have been recognized for their numerous natural benefits. Their mineral content and their extraction site determine their colours and benefits (remineralizing, decongestant, regenerating, ...). - ... We offer powder-form or ready-to-use products that can be applied as a cataplasm (face, body and hair). Marine Sediment have an effective astringent property that is particularly suited for greasy skin. It tightens the pores, making the skin look finer. The skin is visibly purified with a healthy glow. It is also appreciated as hair cataplasms. Sédiments marins is suitable for face and body treatments. - Increasing exchange of its marine ions. Limon marin helps decongest and soothe body in general and joints in particular.It is also appreciated as hair cataplasms. Limon marin is suitable for face and body treatments. Man has always used plants for their medicinal virtues. The plants' origin and species determine their numerous natural benefits. Phyto encompasses all practices that imply the use of different medicinal plants. The treatments are traditionnally used on body and face for different applications. This rich and creamy wrap offers effective antioxidant action, improving skin tone for long-term results. Ayurvedic is suitable for face and body applications. The sea is an exceptionally rich and diverse environment, especially regarding minerals and trace elements. Their soothing and relaxing properties will transcend your bath in a moment of pure pleasure. The sea is a very rich environment, both in terms of quality and diversity, especially given its exceptional contents of minerals and trace elements. Our bath salts concentrate all the goodness of the sea. Bath salts from Bora Bora, with a pleasant monoï fragrance will take you to world of relaxation and escape. They will colour your bath water with a beautiful turquoise blue. The sea is a very rich environment, both in terms of quality and diversity, especially when it minerals and trace elements are considered. This richness is crystallised out in salts that concentrate all the goodness of the sea. The seaweeds are chosen for their relaxing and soothing properties. The bath salts obtained by this unique blending form a natural complex that releases all its richness, essential for the body. Specially developed, these alginate peel offs are a new generation of treatment that bring total satisfaction for an application that becomes a pure moment of well-being. Beauticians will appreciate the easy use of the blend. Masks and bodywraps apply easily and peel off in one simple movement without leaving any trace on the skin. Our peel offs perfectly follow face and body contours, and hydrate the skin while enhancing the penetration of the actives. Mixed with our activators (Peel Off Water, Source +, Gel), their effects are increased tenfold. In less than 1 minute, your mask is ready to use. Save more than 50% of time per treatment: top efficacy with a perfect blend ! Let's work together for the health and the beauty ... naturally! Specially developped, these alginate peel offs masks are a new generation of treatment that bring total satisfaction for an application that becomes a pure moment of well-being. Beauticians will appreciate the easy use of the blend. Masks apply easily and peel off in one simple movement without leaving any trace on the skin. Peel offs perfectly follow face contours, and hydrate the skin while enhancing the penetration of the actives. Specially developped, these alginate peel offs are a new generation of treatment that bring total satisfaction for an application that becomes a pure moment of well-being. Beauticians will appreciate the easy use of the blend. Bodywraps apply easily and peel off in one simple movement without leaving any trace on the skin. Mixed with the activators (Peel Off Water, Source +), their effects are increased tenfold. Essential part of the treatment, we offer a new range of scrubs combining natural and innovative ingredients in order to transform this essential stage in intense moment of well-being. The ingredients have an efficient exfoliating action on the face or on the body depending on the different textures and mesh sizes. Their natural high content in vitamins, minerals and trace elements allow simultaneous nourishing and repairing actions for a smooth exfoliation. Some ingredients also bring a nice visual effect which reinforces the interest of the product. Papaya stimulates the synthesis of arginine and proline, two amino acids recognized for cell regeneration. Pineapple has protective and moisturizing properties which are essential for preventing wrinkles. After the treatment, the skin is exfoliated and shines again. This marine scrub gently eliminates dead cells that accumulate on the skin's surface. 100 % natural, it has been specifically formulated in our laboratories to suit the most sensitive skins. - Laminaria Seaweeds are brown algae with high contents of alginates which stimulate the function of beauty treatments and soften the skin. Their trace elements naturally nourish the skin. - Irish moss (Chondrus crispus) is a red seaweed. Its mechanic exfoliating action clears the skin of dead cells and activates micro circulation thanks to its seaweed polysaccharides. The clarified skin looks fresh and bright again. This original formulation allows you to create a fluid scrub with a delicate monoï scent and a subtle warmth. Bora Bora sand combined with gentle micro-particles eliminates dead surface cells and refines the skin’s texture. Vanilla oil helps to regenerate the epidermal hydrolipidic film and sooth the skin. Senses will be awakened and you will experience a stunning well-being getaway with monoï fragrance. Skin’s softness and comfort are restored to allow the skin “to breathe”. Mousse treatments have been formulated in order to create an innovative product texture. .
Airy-like, with or without heating effect, the crackling of the mousse textures will awake your senses and add a playful touch to your treatments. With a rich and airy texture, this Hot Chocolate Mousse ressembles the dessert highly appreciated by gourmet food lovers. Cocoa is rich in polyphenols and vitamin A which are powerful anti-oxidants that neutralise free radicals and slow the effects of ageing. Its tannins have astringent and toning properties which firm the epidermis again. It is a magical treatment where food-lovers and beauty collide: all the pleasures of chocolate concentrated in a sensual well-being treatment. The strong hydration capacity of Laminaria digitata nourishes the skin, making it strong and revitalized. The high mineral content of Lithothamnium calcareum stimulates and remineralizes the skin. Its absorbing property accelerates the elimination of toxins during the treatment. The heating effect stimulates perspiration which helps eliminating toxins and penetrating of active ingredients. For the man, hair is a symbol of strength. Let's work together for healthy, beautiful and strong hair ! The Nourishing Hair mask is a special formulation which has been developed by our Laboratories and studied to feed and moisturize dried, dull and frizzy hair. To create a real smooth formulation, we have mixed cocoa butter with blackberry vinegar and safflower oil to obtain a smooth and light cream which melts immediately in hair.